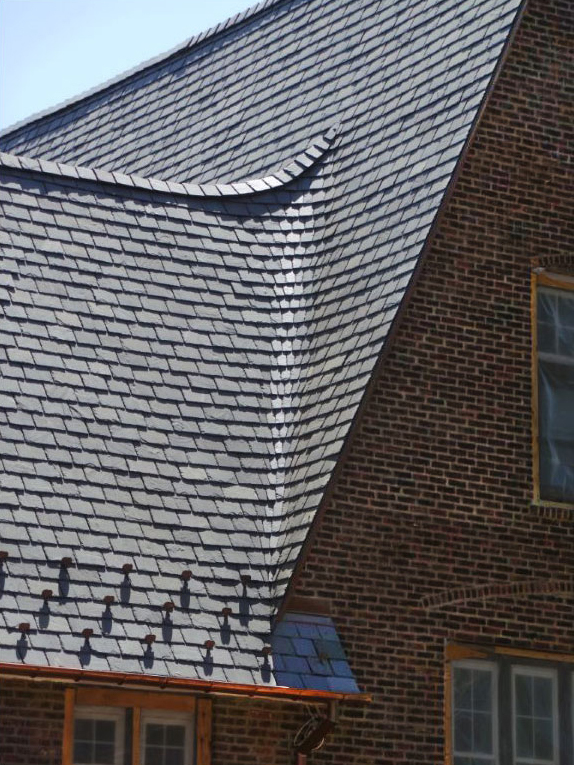 The slate on a roof can outlast the materials fastening it to the roof. That’s why we recommend the use of copper nails, flashing and valleys. However, the life of the roof is extended even further and a more unique style is created valleys are made with slate. This is a fine example of that technique. This roof consists of a blend of Greenstone’s Vermont slates: Vermont Clear Black, Vermont Gray / Black and Semi-weathering Gray / Green. The Metro New York residence features an intricate all-stone closed valley created by the expert craftsmanship of L&M Roofing Contractors. The closed valley is not only beautiful, but with the slate covering the copper flashing, it is sure to be maintenance free for over a century. Thanks to L&M Roofing Contractors for providing the photo.